Well, some time ago, I realized that maybe all these people aren’t exaggerating. So I started to consider other possibilities. Finally, I asked the proper question, “How often do you change your toothbrush?” And I always heard the same answer, “I’m using the one you gave me the last time I was in for my cleaning!” Wow! 6 months! No wonder your mouth is in that condition! In effect, you haven’t been brushing your teeth for months! 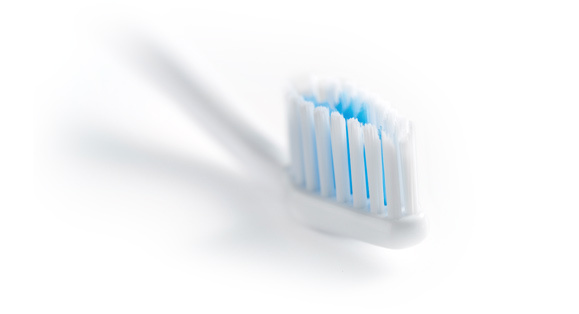 Years ago, toothbrushes were manufactured with firm bristles for maximum scrubbing power. But because people are keeping their teeth longer than ever before, we now see the long term effects of firm or even medium bristled brushes. They can damage the teeth and gums by wearing them away. So toothbrush manufactures now produce soft toothbrushes. In fact, I don’t even know of a firm bristled toothbrush on the market and the medium bristles are becoming ever harder to find. And that’s great because the soft bristled toothbrushes are much better for us. 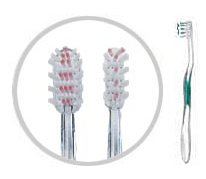 The soft bristles will not damage our gums or teeth and they are much more comfortable to use. HOWEVER; they do not last nearly as long. So as dentists, I think we need to re-train the public about toothbrush renewal. The softer bristles lose their performance after about 60 uses. So if you are brushing your teeth twice a day, you should replace your tooth brush every 30 days or 4 weeks. If you brush 3 times a day, you should change your brush every 20 days. I would even go so far as to say that if the bristles are splayed, bent, or flared, you’ve waited too long. You need to think of it like this: every time you use your brush, the performance is a little less. And lower quality brushes have an even shorter lifespan. But I remind my patients, “Every dollar yon spend on a toothbrush, is $100 you will save in the dentist office!” So think of spending your money on toothbrushes as an investment in time, money, and comfort! Wash out all of the toothpaste out of every use. 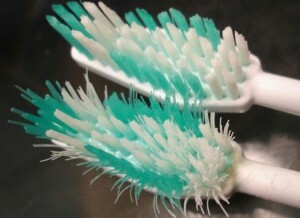 Don’t let any toothpaste dry in the bristles. 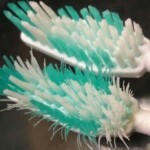 Do not store the toothbrush with the bristles face down.